The people of the Bay area of California are about to be sprayed with a new pesticide not registered with the Environmental Protection Agency (EPA), in a pre-emptive strive against a perceived threat from the Light Brown Apple Moth. The pesticide used to spray Santa Cruz last year was the same product, but with only one active ingredient. The new and improved Checkmate contains two active ingredients. It is this new version that will be used on Bay Area residents. The new version of the pesticide contains a new active ingredient that has not been approved by the EPA. 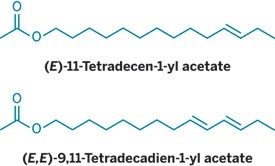 The picture below shows the original ingredient, (E)-11-tetradecen-1-yl acetate, which was in the original product, and the second ingredient, (E,E)-9,11-tetradecadien-1-yl acetate, which was not, and is the ingredient currently under exemption from EPA registration. SUMMARY: EPA has received a quarantine exemption request from theUnited States Department of Agriculture/Animal and Plant HealthInspection Service (USDA/APHIS) to use the pesticide (E,E)-9,11-tetradecadien-1-yl acetate (CAS No. 30562-09-5) to treat host plants tocontrol the Light Brown Apple Moth (LBAM). The Applicant proposes theuse of a new chemical which has not been registered by EPA. Due to the unique nature of this emergency situation, in which the time to reviewthe conditions of this situation was short, it was not possible toissue a solicitation for public comment, in accordance with 40 CFR166.24, prior to the Agency's decision to grant these exemptions. This exemption is dated July 2007. The spraying is to begin in August 2008, over a year after the exemption was granted. "Because of that exemption, the spraying program isn't subject to state approval, according to representatives of the state Department of Pesticide Regulation" (Kay, 2008). Arnold Watch. (2008). Arnold's Top 100 Donors. C&EN. (2007). Rancor over Pesticide Spraying in California. CBS 5. (2008). Outrage over Planned Bay Area Apple Moth Spraying. EPA. (2007). Federal Register Environmental Documents. Free Patents Online. (2008). Communication Disturbing Agents and Method for Disturbing Communication. Kay, J. (2008). Experts Question Plan to Spray to Fight Moths. San Francisco Chronicle. Kay, J. (2008). State Plans Bay Area Pesticide Spraying. San Francisco Chronicle. Political Friendster. (2006). Rate the Roll International Corporation – Stewart Resnick Connection. Authors Bio: Barbara H. Peterson is retired from the California Department of Corrections, where she worked as a Correctional Officer at Folsom Prison. She was one of the first females to work at the facility in this classification. After retirement, she went to college online to obtain a Bachelor's degree in Business, and graduated with honors. The most valuable thing she received from her time with UOP was a realization that her life's passion is writing. Now her business degree sits in her desk drawer, and she counts herself in the category of Writer/Activist. Someday she will make money writing, but that is not why she does it. "I do it because I must. A driving force compels me to reach out to others with what I learn about the condition we the people are in, and that is what I devote my time to. After all, time is the most precious thing we have, and the older I get the more I want to use it wisely." Barbara lives on a small ranch in Oregon with her husband, where they raise geese, chickens, Navajo Churro sheep, Oggie Dog, a variety of cats, and an opinionated Macaw named Rita. She believes that self-sufficiency and localization of food sources will be necessary to survive the coming depression. To this end, she has put up a website to share information at: http://survivingthemiddleclasscrash.wordpress.com. Her philosophy is this: You are on this earth for a reason - to fight for the light. Your words are swords that penetrate the darkness with truth and light. You have a purpose. This page contains a single entry by Toni published on April 3, 2008 11:10 AM. US Army toyed with telepathic ray gun was the previous entry in this blog. CNN HELPS AUTISM DEBACLE BLOW UP IN GOVERNMENT'S FACE is the next entry in this blog.